Let the wind whip, the leaves fly, and the rain drizzle this fall and winter, but don’t let it stop you. As the seasons change, you just need to change with it. So leave the days of flash packs and beer cans behind you and stock up your backpack with warm layers and the ten essentials to enjoy all the beautiful and mesmerizingly muddy trails this season. 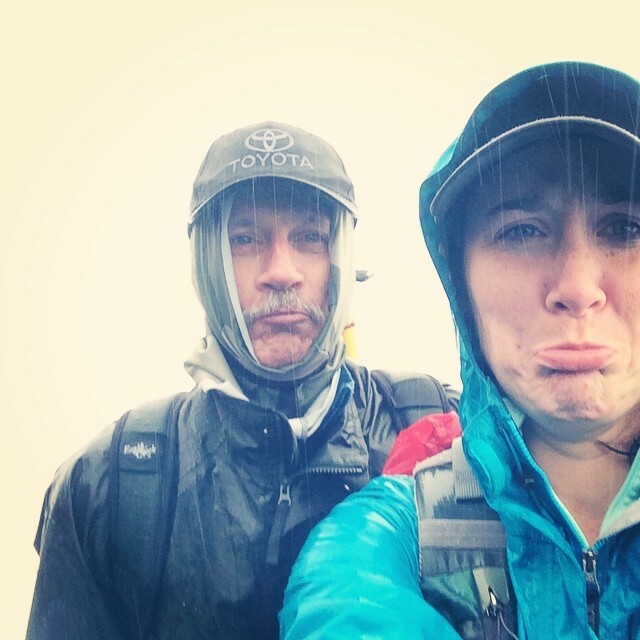 You don’t want to end up with sad faces like my Dad and I on our recent rain-soaked trip to Mt. St. Helens. To help you out, I’ve partnered up with fellow Northwest hiker and blogger, Franziska Weinheimer, to bring you our top 10 hiking goodies for fall and winter in the Pacific Northwest. Even on the most beautiful fall days, the weather can change rapidly in the Pacific Northwest. Make sure you have a rain cover with a working drawstring that fits your backpack. As soon as you hear those first rain drops on the orange and yellow leaves, strap it on so all your gear stays dry. Many modern backpacks come with a rain cover in the lower zip pocket, but if you’ve lost yours or it wasn’t included, pick one up at REI or your local outdoor shop. In a pinch a trash-bag works well too! Just cut holes for your shoulder straps. 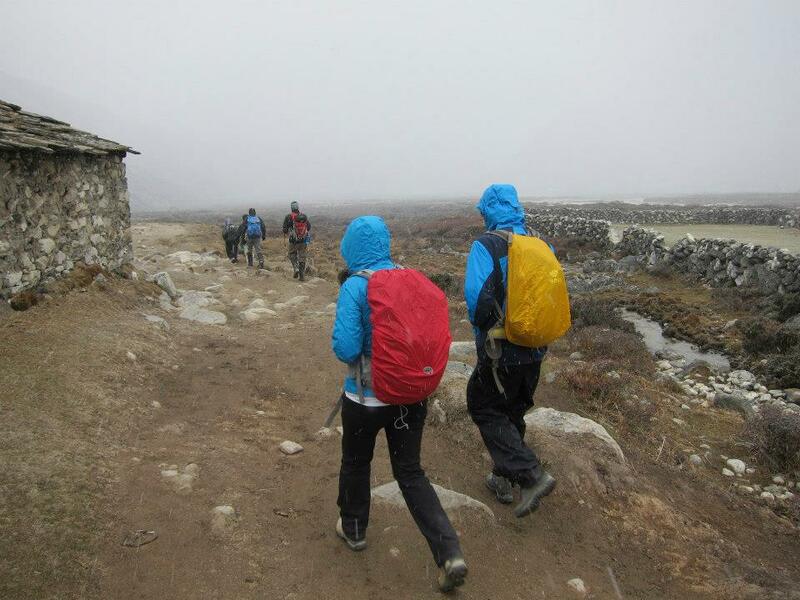 Also don’t forget to let the rain cover dry off after each hike so it doesn’t mildew. In the crisp cool fall air, a cozy, warm sweater works wonders as an outer layer or a mid-layer beneath a rain coat or insulated vest. Pick one that is made of wool like Prana’s Lucia Sweater, my new favorite trail friend this fall, as it won’t smell as bed if you sweat and wick’s water. I also love SmartWool and Icebreaker’s wool base-layers for hiking. When it’s cold and nasty out, you want to have multiple layers (top and bottom) stashed away in your backpack. Many of us remember to do this, but the key to keeping that emergency gear useful for winter weather is to keep it dry. Roll each item and stuff it in a dry-bag then into you backpack. This way even if the worst weather, your warm sweater, gloves, and hat are all dry when you need them. These bags come in all sizes. I have small and large bag that I keep on hand for a variety of gear. In the Northwest, the sun sets early in the fall and winter. By 5pm it can be dusky if not dark – especially with dark cloud cover. And while, you should know before setting out for a hike that you’ll be back or to shelter before sundown, at times hikes don’t go as planned. Zip away a headlamp just in case you need the extra light for the return hike. 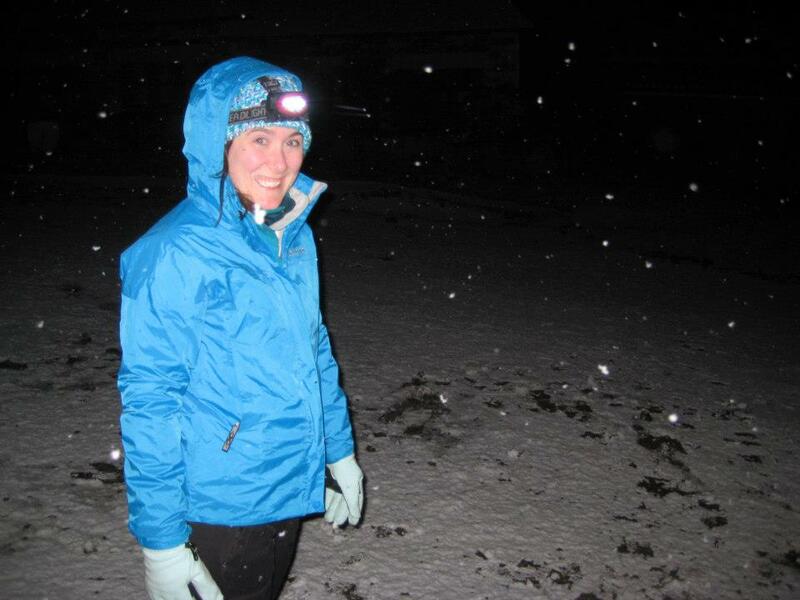 I recently purchased a Black Diamond Cosmo Headlamp. It has multiple modes for seeing in different light qualities, is water resistant, and won’t break the bank at only $29.99! For those of you who are ready to head out into the snow for a white-washed backcountry adventure, an Avalanche Beacon, probe and snow-shovel are an absolute must. It is not okay to just carry these items either; you need to know how to use them! REI offers great Wilderness Classes or just get some friends together and learn to use your equipment in a safe open area before taking them on the trail. I’m still gathering my avalanche kit for this winter’s backcountry ski trips and the items are not cheap, but they will save your life in a winter emergency. Get five more essentials over on Franziska Weinheimer’s blog, Hike Oregon! What other gear do you like to pack for your fall and winter adventures? Wouldn’t ever be out Winter steelheading or salmon fishing without SmartWool/Icebreakers. Have four layers to play. About as thick as an old Ragg Wool Sweater of old. I live in a completely different area, but I would agree with your choices. Great post!